Presenting a Sacred Classic that was for over a Century only available in our dreams, and to the Wealthy, that has returned to Grace the World Stage of the Amulet World; The Pra Somdej Wat Rakang (Pim Gaes Bua Dtoom) Banju Kru Wat Sadter Ayuttaya of Somdej Pra Puttajarn (Dto) Prohmrangsri. This model is a Pim Gaes Bua Dtoom, with a subtle indentation running vertically down the middle of the torso of the Buddha Image, and a 'rounded lotus' topknot (Gaes Bua Dtoom). 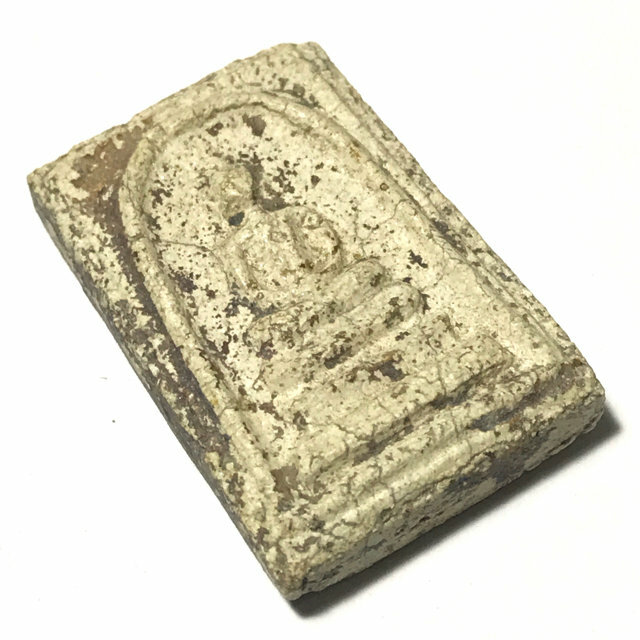 The Pra Somdej Wat Rakang Kositaram Kru Wat Sadter amulets were found buried in the Putta Sayaas (Sayasana Reclining Buddha) statue, at Wat Sadter in Ayuttaya, and in the Chedi Stupa, which is recorded as having been built in the year 2414 BE, one year before the passing of Somdej Pra Puttajarn (Dto) Prohmrangsri (Wat Rakang Kositaram). The amulets were made in remembrance of Somdej Dto's Parents, as was the Sayasana Buddha statue and Chedi Stupa of Wat Sadter. The Pra Somdej Wat Sadter amulet is no longer in any serious need of doubt as to who made them when we study the History, Visual Aspects, and Documented Evidence, including confirmation by ex abbot of Wat Rakang Kositaram Luang Phu Nak, that the Pra Somdej Wat Rakang Kositaram found at Wat Sadter, were placed in the Buddha Statue and Chedi Stupa by Somdej Pra Puttajarn (Dto) Prohmrangsri himself, and are one and the same amulet with the Pra Somdej Wat Rakang Kositaram of Immortal Legend. The Putta Sayaas reclining Buddha statue was built on the grounds of Wat Sadter from Bricks and Mortar with Cement sculpture in the form of a Buddha lying down on his side, with his head on his palm. The statue measures 52 Meters Long and 9 Meters Wide, with its highest point being 16 Meters High. The Buddha statue is hollow, and it was in the hollow chamber of the statue where the amulets were hidden. The Pra Somdej Wat Sadter amulets were discovered in 2499 BE, when the Prime Minister came to pray to the statue at the temple, and saw that it was in disrepair, and so he called the Ministry of the Municipality Government Office and told them to organise for the repair work on the Pra Non Sayasana Buddha statue. And so, as the restoration works began, and the interior of the statue was opened, a variety of different Pim (models) of Pra Somdej amulets were discovered to be hidden within. Because in that time, the Pra Somdej Wat Rakang Kositaram of Somdej Pra Puttajarn (Dto) Prohmrangsri was not yet a world famous and priceless amulet, nobody paid overly much attention to the find as much as we do in the present day, and so the news of the find was not widely publicised around the country at all. So Thankfully, the batch slipped past the eyes of the speculators and the 'Sian Pra Niyom' Amulet Scene Leading Auctioneers, who monopolise such amulets by buying them all up, waiting for them to become inpossible to find, and then slowly release them at millionaire prices. As a result, in the day and age when a true Pra Somdej Wat Rakang Kositaram of Somdej Pra Puttajarn (Dto) Prohmrangsri would otherwise be impossible to find, or at least impossible to afford, the Pra Somdej Wat Rakang Kositaram Banju Kru Wat Sadter amulets are easily authenticated by any observant eye and diligent history student, who will add up the date of the building of the statue coinciding with Somdej Pra Puttajarn Dto's lifetime, the fact he built the statues, and the fact that the amulets were found within it, as well as the 'Nuea Ha' (visual content) being identical to the Pra Somdej Wat Rakang Kositaram of Immortal Fame we all know and revere (and wish for). And so the amulets were randomly shared and distributed between important committee members who helped with the restorations, and the amulets were not known about by the general public. The amulets remained in the possession of a small group of people right up to the present day, until some years ago when students and historians, devotees and amulet aficionados managed to stitch the missing links together, and bring the necessary evidence to light. Then the owners of those amulets distributed came out iof the shadows, and the amulets came into visibility of the general public in Magazines and News articles. Below: A Close Up look at the surface of the Muan Sarn Sacred Powders reveals pieces of 'Pratat' and the various elements of a true Pra Somdej Somdej Pra Puttajarn (Dto) Prohmrangsri. The residue of the ancient lacquer which remains stuck to the surface shows its age and pedigree. What is difficult to reveal in the photos, but which can be seen with an eye loupe under the naked eye, is the presence of tiny flecks of pure gold powders, which Somdej Pra Puttajarn (Dto) Prohmrangsri would mix into the Muan Sarn clay for making Pra Somdej. It is difficult to catch them under the light, but once you have seen it once, you will notice the presence of gold powders visibly more easily thereafter. In the year 2549 BE The Chedi Stupa of Wat Sadter temple was restored again, and Amulets were removed and released into Public Distribution, and again in the year 2552 BE, during the second restoration of the Sayasana Buddha, when the Committee decided to reopen the Kru Chamber within the Buddha statue again and remove more of the amulets for public distribution to raise funds, and allow the devotees to obtain such a sacred amulet of Master Class Status. The Pra Somdej Amulets of the Kru Wat Sadter Hiding Place Find, were hidden in the Kru immersed below the water level for a very long time, which caused the original 'Rak' lacquer which covered many of them to wear out and detach from the surface of the amulets. This resulted in this series of Sacred Pra Somdej possessing their own inimitable appearance, which differs from the Pra Somdej Wat Rakang Kositaram, due to the long time period spent under different atmospheric conditions, with high moisture and humidity. The result is a very eye catching and Sacred appearance which has only served to increase the depth of study content when examining the various features and aspects of the Muan Sarn Sacred Powders (ageing, contraction, ingredients, hardness, density, surface texture) The rear faces are found with varied appearance, depending on whther they were laid on a Mai Gradan (blackboard) which leaves ridged lines on the back face, or if they were laid on stone or other surfaces to dry after they were pressed, which leaves a smoother surface, or even a porous holed surface. Precisely these patterns are evident on the Pra Somdej at Wat Rakang Kositaram, and are found to be identical to those in the Pra Somdej Kru Wat Sadter amulet find. The Pra Somdej Wat Rakang Kositaram of Somdej Pra Puttajarn (Dto) Prohmrangsri which were kept at, and released through Wat Rakang, were never placed in Kru Burial, and hence maintained a clean surface appearance. But the Pra Somdej which Somdej Pra Puttajarn (Dto) Prohmrangsri took and buried in hiding chambers in temples around the country, were subjected to climatic changes, flooding, droughts and heatwaves. This is the reason for the fact that the red, black lacquers found on the surface of the amulets found at Wat Sadter, are flaked off from exposure to water. The remaining bits of lacquer which can be found visible in lesser or greater amounts on the Wat Sadter amulets is extremely dry and hermetically attached to the surface of the amulets, from well over a Century and a Half in burial. In the Wongarn Pra Niyom Amulet Aficionado circles, this is called 'Nuea Rak Dtaay' meaning 'the lacquer has passed away'. This is used to refer to the effect of the laquer breaking off leaving stains in a crackled pattern, that lends a marbled effect to the surface of the amulets, and only serves to enrichen its character and eye- pleasing effect. Some exhibits remain with highly evident lacquer traces, whereas others have been cleaned at some point (some devotees would clean the amulets, others would leave them in their natural state, according to personal preference). On those exhibits whose surfaces have been cleaned of lacquer coating, the surfact of the clay has a marble-like crackled appearance, which the Amulet World calls 'Nuea Dtaek Lai Nga', which means 'Broken Ivory Markings'. These natural markings lend a subtle beauty and individual look to each amulet, not two amulets looking exactly the same. Note; The word 'Nga' means two things; 1. Ivory and 2. Sesame. It is clear that the reference is to Ivory, for the similar markings found on the surface of the amulets. it would not make sense to use sesame as an allusion). The Muan Sarn is a wondrous thing to examine under the eye loupe, and with extensive perusal, will slowly but surelly reveal the inner secrets of the many ingredients within its Muan Sarn Sacred Clay, as the eye becomes ever more fine tuned to gazing into the depths beyond the surface with increasingly subtle insights arising regarding the composition of the Sacred Clay of the Pra Somdej Wat Rakang Kositaram amulet of Somdej Pra Puttajarn (Dto) Prohmrangsri. For the Group who revere the Wat Sadter amulet as that of Somdej Pra Puttajarn (Dto) Prohmrangsri Wat Rakang Kositaram, we are beholding an Eternal Classic, and one of the most Sacred Amulets, which has blessed us by escaping the clutches of the speculative investors, and is affordable within the reach of most people who seriously seek the honour of wearing and revering what well studied aficionados accept to be a true Pra Somdej Wat Rakang Kositaram of the Great Somdej Pra Puttajarn (Dto) Prohmrangsri.